For the purpose of the Data Protection Act 1998 (the Act), the data controller is Frisco Handyman of 10720 Jackson Ln..
1.1.1 Information you give us. 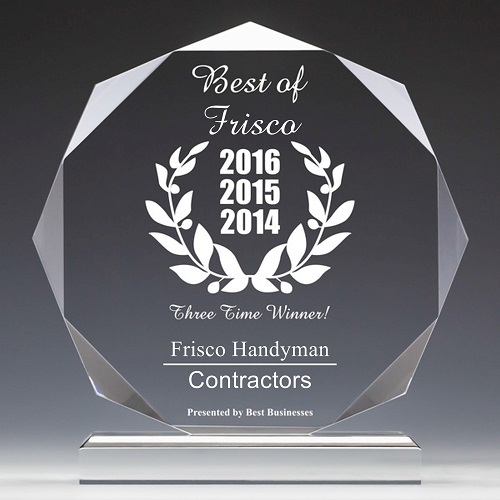 You may give us information about you by filling in forms on our site https://friscohandyman.net (our site) or by corresponding with us by phone, e-mail or otherwise. This includes information you provide when you register to use our site, subscribe to our service, search for a product, place an order on our site, participate in discussion boards or other social media functions on our site, enter a competition, promotion or survey, and when you report a problem with our site. The information you give us may include your name, address, e-mail address and phone number, financial and credit card information, personal description and photograph. 4.1.2 Advertisers and advertising networks that require the data to select and serve relevant adverts to you and others. We do not disclose information about identifiable individuals to our advertisers, but we may provide them with aggregate information about our users (for example, we may inform them that 500 men aged under 30 have clicked on their advertisement on any given day). We may also use such aggregate information to help advertisers reach the kind of audience they want to target (for example, women in SW1). We may make use of the personal data we have collected from you to enable us to comply with our advertisers’ wishes by displaying their advertisement to that target audience. 4.1.4 Credit reference agencies for the purpose of assessing your credit score where this is a condition of us entering into a contract with you. 4.2.2 If Frisco Handyman or substantially all of its assets are acquired by a third party, in which case personal data held by it about its customers will be one of the transferred assets. 7.1 The Act gives you the right to access information held about you. Your right of access can be exercised in accordance with the Act. Any access request may be subject to a fee of $10 (USD) to meet our costs in providing you with details of the information we hold about you.